One month ago, I embarked on a journey of discovery. I did so after determining the Chamber would greatly benefit if I met with each individual who announces their intent to be a candidate for a local elected position. This includes candidates for the: District 709 School Board, the Duluth City Council and the Mayor of Duluth. My talented colleague, Roger Wedin, Director of Policy & Education, joining me in this endeavor. It has been an enlightening and encouraging experience. While we still have candidate meetings to schedule, our interactions have already been abundantly productive. We have met with six of the twelve announced candidates. I am reaching out to the remaining candidates to arrange for our meetings. I describe these fine individuals as "announced candidates" because the official filing for local elected office does not begin until July 7th. Consequently, community members will not know, for sure, who is officially running for office until the filing period concludes July 21. When contacting candidates, I preface my request to meet with them by assuring them that our meeting will not be an interview. 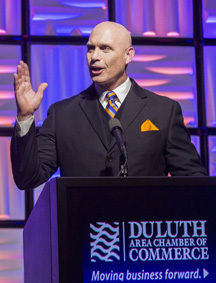 I also reassure then the Duluth Area Chamber does not endorse candidates. Rather, the Chamber educates our members regarding candidate stances on local issues that impact our business community. I explain that our motivation to meet with them is simply to get to know them better and to better understand their positions on local issues. It is also an opportunity for the candidates and the Chamber to establish an ongoing and production conversation pertaining to local public policy. Roger and I also let them know the Chamber is planning to host Candidate Forums between September 15th, which is Primary Election Day, and the General Election, November 3rd. We plan to host three forums: a City Council Candidate Forum, a Mayoral Candidate Forum, and a District School Board Forum. In recent years, we have partnered with the Duluth News Tribune to host the forums. The Tribune has been an outstanding partner in bringing these candidate forums to our beloved community. We hope to, once again, partner with the Tribune. I anticipate the local media will cover these anticipated forums. By doing so, the media outlets allow community members to access the forums on television, radio, and various websites. Our community benefits when we understand the positions that candidates plan to take on local issues. Duluth's future is bright. I am confident of this, after meeting with these intelligent, motivated and conscientious individuals who seek to serve our community as elected officials. I hope you will join me in setting out to learn as much as we can about Duluth's future leaders.